Good budget down bag. 650 fill down is just as warm as the lighter stuff but heavier. Fits true to size, normal is for 6'0'' and shorter. Has cold spots in the foot box. I've had this bag for years. It is my first winter bag. The particular one I own is the orange and rust one with the black inside, not the newer all orange or all red bag. 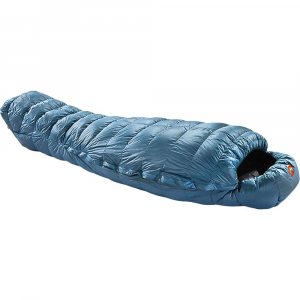 My biggest gripe is not that this is not ultralight, it is what it is and you get what you pay for. My biggest con for this bag is that the foot box is so narrow and the loft is so thin in that area that I get cold just from convection through the feet. Smaller feet or side and stomach sleepers might not have as much of a problem, but sleeping on your back and having your feet press out from two different points reduces the loft in that area. In addition to this, the loft in the foot area is actually measurably less than the rest of the bag. I have laid this bag out flat and empty and fluffed in as much down as possible to foot area and even then the max loft in some spots on the foot box is just 1-2 inches while the rest of the bag has 3+ inches of fluff. The baffling needs a redesign. I suspect with the new versions they have fixed it, but if you get cold feet when winter camping, definitely lay the bag out and check for this. Interesting. Marmot is usually a pretty reliable bag maker. Some of the best sleep I've had lately has been in this bag, in the woods, in the winter. I've used this bag for one season of winter camping in northern Minnesota, and I'm very happy with it. I'm a cold sleeper, but in temperatures around 10-20 F it kept me very comfortable. It's like sleeping in a (warm) cloud. The coldest night I used it was around -10, and I slept OK, but was a little chilled. It's a lot roomier than a lot of mummy bags, but it's fairly lightweight and compresses pretty well, especially considering I have the tall version. Oh yeah, and the freakin' zipper actually WORKS, which is more than you can say about a lot of sleeping bags, haha. All-in-all, a kickass bag. I would definitely buy a Marmot again. I used the Marmot 'Never Summer' on all 7 nights on Mt Kilimanjaro. It was nice and toasty even at Barafu camp at 15,300 ft asl! it as 30 degrees F. in my tent! No issues with moisture ether! Recommend. I bought this bag for my last spring trip to Big Bend. I bought this bag for my last spring trip to Big Bend. My wife got the women's version called Couloir. They both are excellent sleeping bags. Since I got the right-side zipper, we were able to join them together easily which was added benefit. I used a liner to keep the inside clean (recommended for all sleeping bags by the way) and I was quite warm in the bag alone and connected during 30°+F nights in the mountains. In fact, I would say this would be overkill during the summer, I had to open up the bag several times to get some air early in the evening. I'm 6' tall and the regular sized bag was both roomy where needed and cozy when I curled up. This was my first down bag and you can tell the difference. It comes with a small trinket pocket which you can load with a handwarmer if desired (not that I've tried it or suggest it). The zipper was way superior to anything I've used; I had no trouble with snags at all. I could see how zipping it the entire way around the face-area would keep you warmer but I didn’t have to test it yet. Did I mention how light this thing is? I am planning on taking it into the Colorado mountains in early spring and will see how it performs in colder/wetter conditions. I'll post a second review when I return. I have the 2007 version of the Never Summer bag, and suspect they didn't update much besides the cosmetics. Why would they have to? It's a great bag! 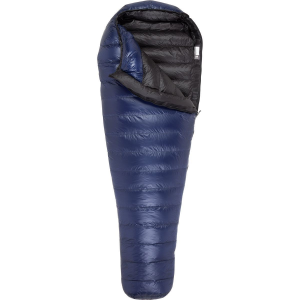 I love the down fill, which allows me to sleep comfortably in nights with temperatures well above the bag's rating without sweating up a storm. 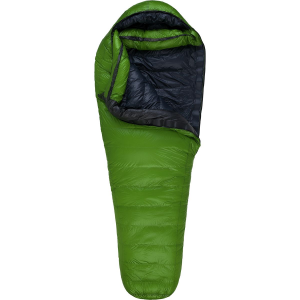 I have yet to use it in under 50 degrees save double bagging it in the winter, so I can't know how it stands up to the rating. It has gotten a little wet and I didn't see the drastic fall in performance I was expecting, which I took as a positive sign. 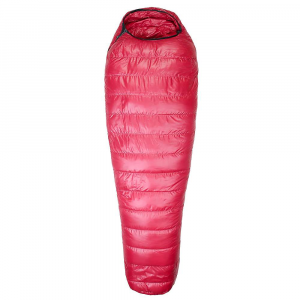 I'm going to recommend it for 3-season backpacking, from 40-75 degrees until I find out otherwise. Bulky, cheap and warm. Comfy and warm with lots of loft. It is certainly tough enough for everyday use too. However, its size and weight make this not the best mountaineering choice. Still, simply amazing for winter dirt-bagging. My favorite bag! I wish my bed at home were this comfortable! My favorite bag! I wish my bed at home were this comfortable! I've had mine for about two years and it has seen a lot of winter action in the Smokies. Spent the night out under the stars on Mt. Sterling with nothing but the bag between me and -5 degree night air! This bag is huge too! Plenty of room to throw clothes and a couple of water bottles in. Awesome bag! I highly recommend it! I've had this bag for two winters and it has been great! No problem getting cold, although it has never seen anything below 10 degrees. I've used it on 10 differnet snow shoe trips, and it packs small and is fairly light. I'm six foot and a got the tall version, which is really great because I love the extra room to stetch out and store clothes during the night.